Pictured from left: Our musically inclined Cakti, Dane Summers, Dan Poirier, and Ian Huckabee. The first installment of the secret lives of Cakti highlighted some colorful extracurriculars (including rescuing cats, running endurance events, and saving lives). This time, we’re taking a look at our team’s unexpected musical talents. If you Google musicians and programming, you’ll find dozens of posts exploring the correlation between musical talent and programming expertise. Possible factors include musicians’ natural attention to detail, their trained balance between analysis and creativity, and their comfort with both solitary focus and close collaboration. Cakti are no exception to this, and creative talent runs deep across our team. Here are a few of our musical colleagues. Contract programmer Dane is inspired by old-time Appalachian music as both a banjo player and flat foot clogger. 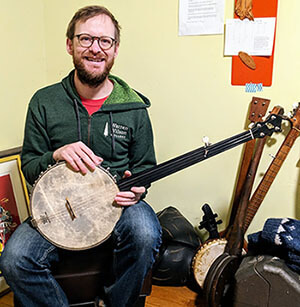 After ten years of learning to play, he’s managed to accumulate four banjos, but his favorite (and the only currently-functional one) is a fretless that he plays in the traditional Round Peak style. He’s working up to singing while he plays, at which point we hope he'll do an in-office concert. Our sharp developer Dan has multiple musical passions. As a singer, he lends his baritone to Voices, a distinguished community chorus in Chapel Hill. You can also hear him a couple of times a month on WCPE, the Classical Station, as an announcer for Weekend Classics. Rumor has it that he’s also a dab hand at the ukulele, though until he shows off his talents at the office we won’t know for sure. Holding the distinction as the only Caktus team member to jam with Harry Connick, Jr., our chief business development officer Ian has played blues guitar since he was 12 years old. He also started his professional career in the music business, managing the NYC recording studios for Sony Music Entertainment. His current musical challenge is mastering Stevie Ray Vaughan’s cover of Little Wing. 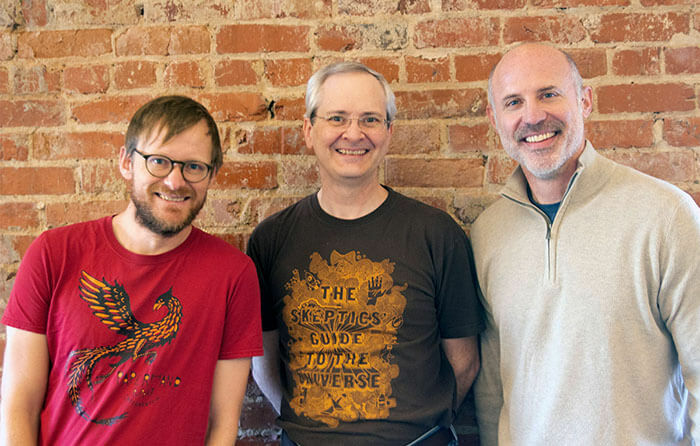 No word yet on whether Dan, Dane, and Ian are planning to start a Caktus band, but we’ll keep you posted. If they do, they’ll have more talent to draw from: our team also includes an opera singer, multiple guitarists, a fiddle player, and others.